When you're 6.5 months old, everything is NEW! 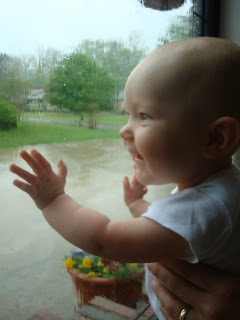 She was having a blast watching the rain. Our 13 year-old is a photography genius and snapped several pictures. Two Weather Gals in the making! :) Our little one has her own website, too! So sweet. Glad you finally pposted a pic of your little. She has gotten so big already. Great shot by your oldest!